Flip-flops! The name says it all. Did you know any of this? Of course, you didn’t and neither did I. In addition, I just didn’t give a damn. Until recently, I was too blissfully content in my ignorance. Having grown up in the Fifties, I had never even worn a pair of flip-flops. Then along came that June day when both my daughter and I finished working at our respective school districts. It was a beautiful summer day - one of those glorious days when it was hot, but not humid. There we were with our first full day of freedom. “What?” but she was already sailing through the front door of the shoe store, expecting me to follow. “How much are these?” I asked a salesman thinking maybe I could squeeze out a ten dollar bill for them. “Dollars?” I shouted wondering how something that almost did not even exist could cost so much. Everyone in the store had turned to look at me as half a dozen emotions including shock, incredulity, and amazement appeared on my face. Embarrassed, I turned to join my daughter who had already broken into gales of uncontrollable laughter that propelled both of us out of the store, into our car and up the highway to a discount department store. 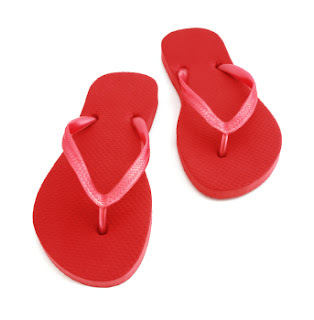 But after purchasing an inexpensive and bland pair of flip-flops and getting a pedicure, my mind kept returning to the sixty dollar pair that would have looked perfect with my hot pink, perfectly painted toenails. Great story! Your a wizard with words... I want more!